You will want to read the story of this master carver. Good morrow and well met! Have ye had yer breakfast yet? Good. I’ve somethin’ t’show ye methinks’ll put a smile on yer face, and yer woman’s, too. Ah, yes, what a brilliant idea! We’ll bring a mug of ale — or a horn of mead, as you like — along, it’ll brighten our course. Look, there he is. He calls his craft, “Oleg Wood Art.” He says he has been carvin’ since he was a lad. Trained by a master carver, he was. The first piece he ever sold was a bust of Archimedes, at the tender age of 12. Let’s take a look at his goods. I feel certain that ye will approve. Ah! 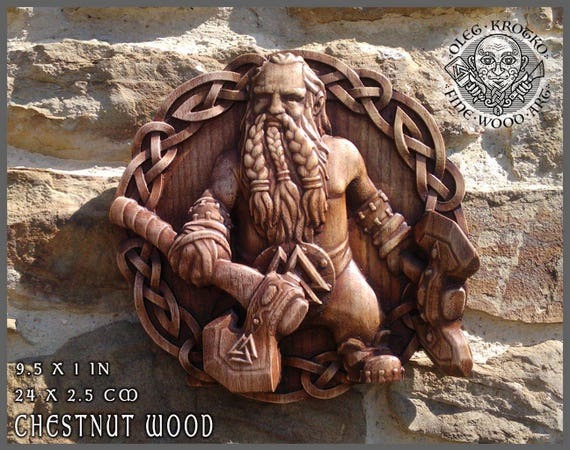 Here are some pieces that the master carver created for those who possess the Viking Soul. This first one is an image of Valkria. According to Norse legend, the Valkyries were the women who chose which men may die in battle and which may live. Half of the men who were slain were brought to Valhalla to be ruled by the god Odin, where they bore mead and prepared for Ragnarok. 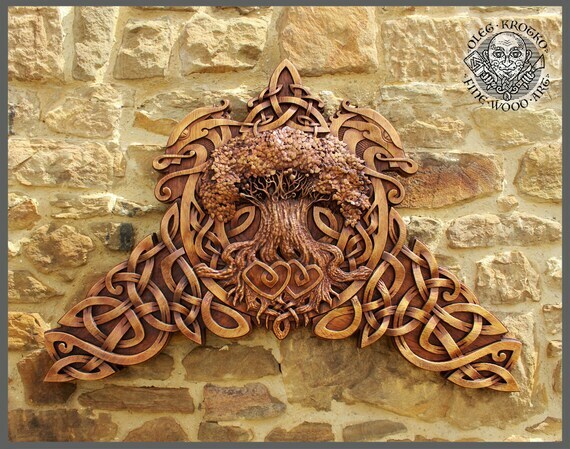 Several sizes of the Oleg Wood Art Valkria are available. And lay yer eyes upon this image entitled Odin and His Ravens. 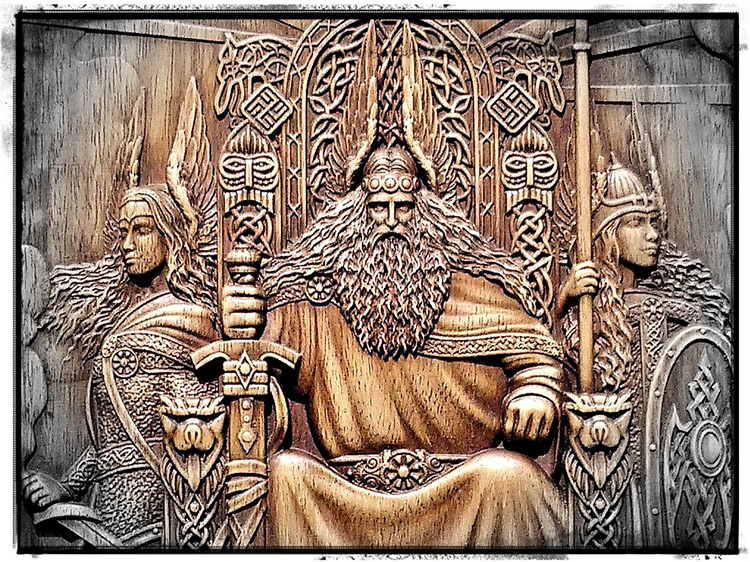 It’s been commonly told that Odin kept two wolves as companions, Geri and Freki. 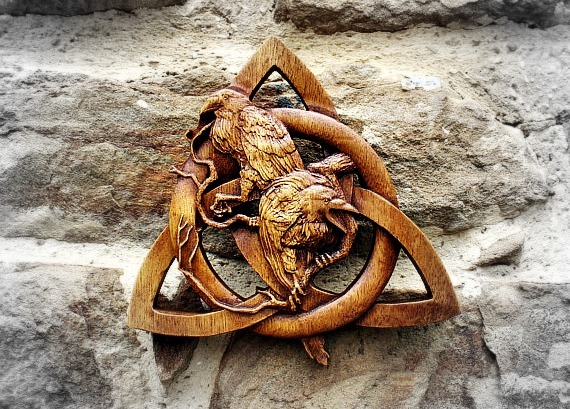 His ravens Huginn and Muninn were charged with bringing information from all the regions of Midgard…perhaps in this carving, the term “ravens” is metaphorical, as this Viking bears an axe in each fist. 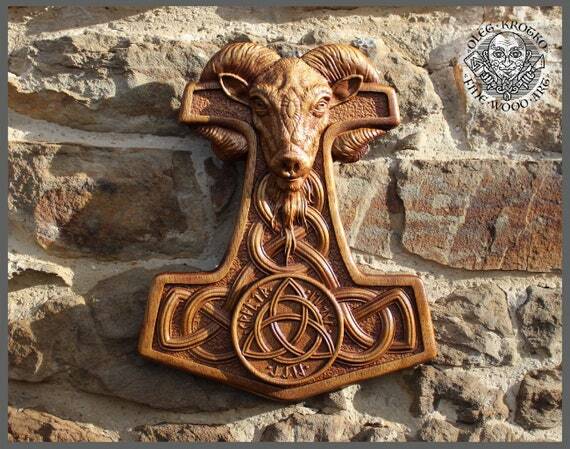 Now here is a stunning carving of Thor’s hammer. The Norse folk called it Mjölnir. It was made by two dwarven brothers, and though they mistakenly made the handle too short, it had the power to level mountains. Speaking of Thor, here’s a powerful image of him riding the seas, Mjölnir ready to hand. Gentles, none of the heathen gods have so captured the imagination as Thor. His exploits continue as an inspiration for many of the arts, and of course his name lives on in the keeping of time, as “Thor’s day” is now called Thursday. 25.5 x 17 x 2 inches. The carver wields his craft over more than pieces for the walls. 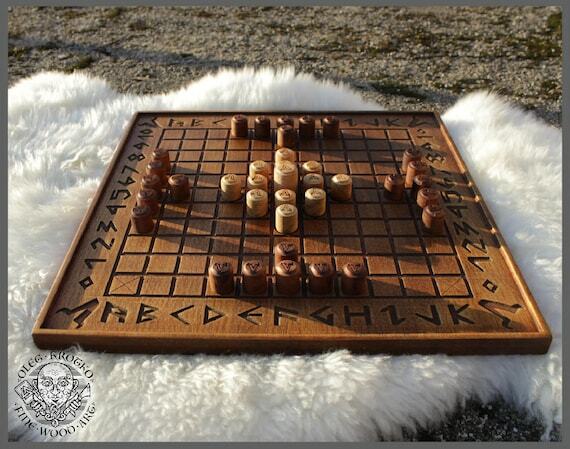 I can picture thee enjoying many a long winter’s nights enjoying this Hnefatafl Minnesota Viking Traditional Game Strategy Board. This would surely be a possession to hand down to thy descendants. Thy sons and daughters could carry fond memories through their years of lively battles with their father over this board. A hand carved version of the Hnefatafl Viking strategy board game. Knowing thy love for the hunt, I’d like you to look at the how the carver captures the majesty of wildlife. This carving of a Deer in the Moonlight is magnificent, isn’t it? Surely ye have seen such stately creatures as these during your excursions. Several sizes of this and other works are available. 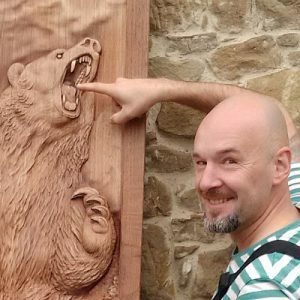 And take a look at this fearsome bear carving. This particular piece measures 22.5×10.5×2.5 inches. I’ve listened to thy tales about fooling many a fish into striking thy fisherman’s bait. This carving is of a Pike taking the hook is sure to please thee. This hand carved pike measures 19.7 x 11 х 1.6 inches. 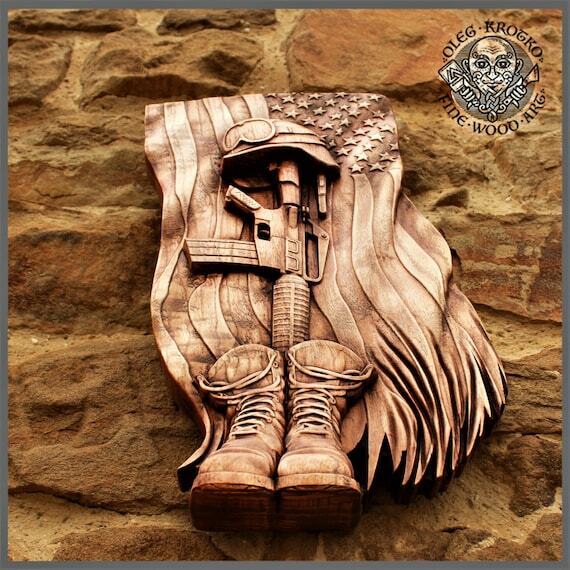 Aye, here are a couple of pieces that he created for American Patriots. 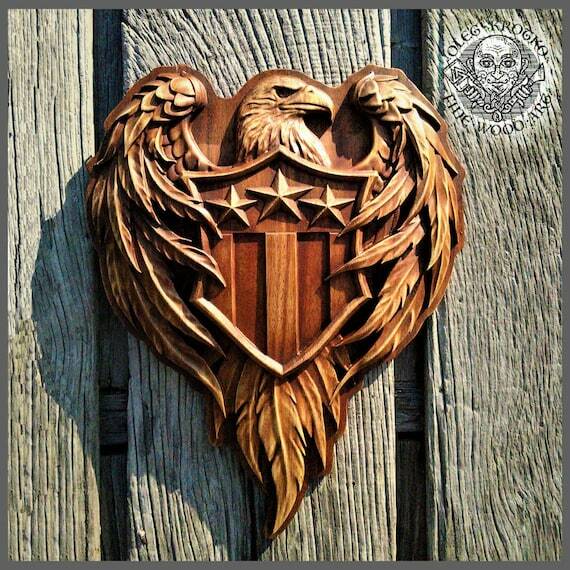 Here is a majestic carving of a Patriotic American Flag Wooden Carved Sign Coat of Arms. The master has surely captured the spirit of the American patriots in this one. This eagle and blazon together measure 15.7 x 12.5 inches. The creation of this Tribute to American Fallen Heroes is sure to honor the memory of the American soldiers who fought and died in their service to their country. This is, without a doubt, a piece that will invoke reverence in the hearts of those who look upon it. If ye have a notion to bring the Lady an ornament to hang about her neck, you might be interested in giving her a hand-carved pendant. This one’s got the face of a fox carved into it. Exquisite, isn’t it? If none of these carvings have yet captured yer eye, m’Lord, the carver says he’ll do custom work. Here are some of the orders he has filled for previous patrons. I can see how a fine coat of arms would make an impressive sight upon the castle walls. Here is one that the carver crafted for the family Short. And here is an exceptionally impressive piece. 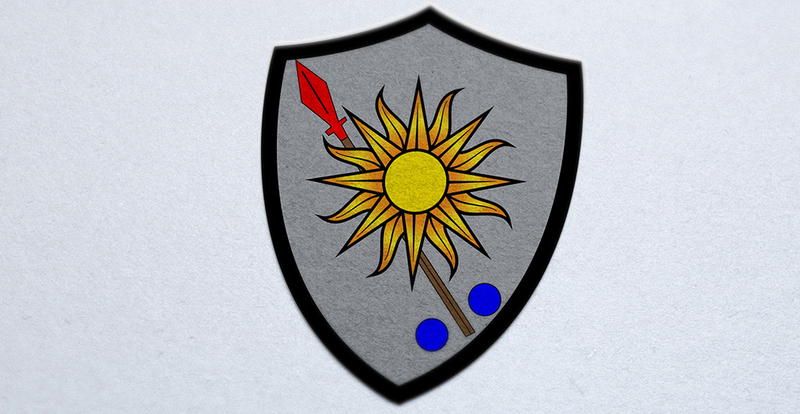 It’s a Dragon Viking Coat Arms. Now, let’s speak to the carver himself. His name is Oleg Peresvet. Oleg Peresvet, the master carver. My friends and I would often compete to see who could make the best sword, or shield, or whatever other stuff boys are obsessed with, and sometimes I would trade the items I made for other toys I wanted… I only work with high-quality wood to create detailed, imaginative, and long-lasting works. I never use chemicals to seal the wood – only non-toxic antique wax – which protects the artwork, but also lets the quality of the wood and craftsmanship speak for itself. I say, gentles, now that ye have met the master carver and looked over his goods, I think we must perforce provide a way to contact him! CategoriesCraftsmen TagsArtisans, Carving, Craftsmanship, Got Wood? 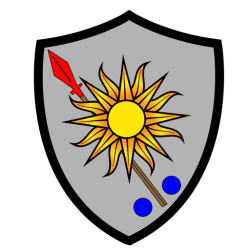 Previous PostPrevious Shield Arms Declares for Morning Wood!